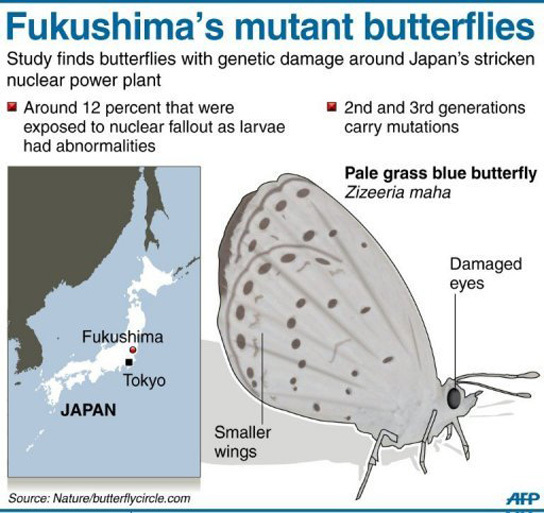 The Fukushima disaster seems to have caused three generations of butterflies near the nuclear plant to mutate. This has raised fears that it could affect other species as well. 12% of pale grass blue butterflies (Pseudozizeeria maha) were exposed to the nuclear fallout as larvae after the tsunami-sparked disaster. The mutations include abnormalities, including smaller wings and damaged eyes. The insects were mated inside a laboratory to see the impact on their offspring, and 18% of their offspring displayed similar problems. Joji Otaki, from the Ryukyu University in Okinawa, states that this figure rose to 34% in the third generation of butterflies, even though one parent from each mating was from an unaffected population. 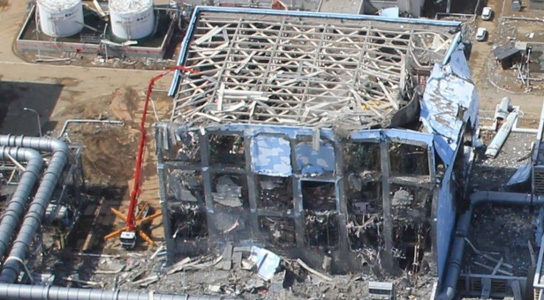 Researchers collected 240 butterflies in Fukushima in September of last year, six months after the disaster, and abnormalities were recorded in 52% of their offspring. This is a dominantly high ratio, which could be the result of both external and internal exposure to radiation from the atmosphere and in contaminated food. The scientists published their findings in the journal Scientific Reports. Comparison tests were carried out by exposing unaffected butterflies to low levels of radiation. The results were similar to the ones found near Fukushima, leaving the researches to conclude that the radiation released from the Fukushima Daiichi nuclear plant damaged the genes of the butterflies. It’s too soon to jump to conclusions about how this disaster could have affected human genetics, since these results could not be directly applied against any other species, but the scientists will conduct follow-up studies on other animals. Young people near the Chernobyl catastrophe experienced thyroid cancer, which may be a concern for young people here. 2 Comments on "Fukushima Disaster Caused Butterflies to Mutate"